BluMochi: **CLOSED** Giveaway: Lucy's Stash "1,500 Followers Giveaway"
**CLOSED** Giveaway: Lucy's Stash "1,500 Followers Giveaway"
To celebrate her blog reaching 1,500 followers, Lucy's Stash is giving away 5 colors from OPI The Muppets Collection. The colors are: Meep Meep Meep, Warm & Fozzie, Designer... Da Better, Excuse Moi!, and Divine Swine. 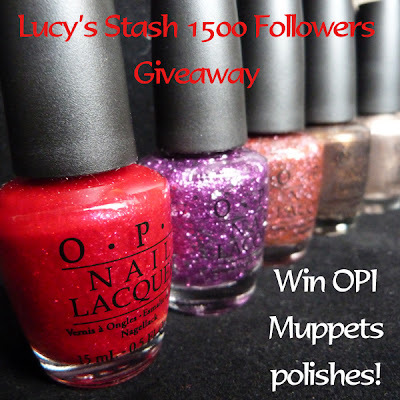 Please check out Lucy's Stash for giveaway details and rules. Giveaway closes January 2, 2011, and is open internationally. Good luck!